Afghanistan has been engaged with more than 30 years of war with thousands of civilians killed or injured since 2001. It is under these conditions that children are at extreme risk of violence, abuse, exploitation and neglect. The children of Afghanistan are growing up in one of the least developed countries in the world. Six percent of babies die at birth and 25 percent before their 5th birthday. 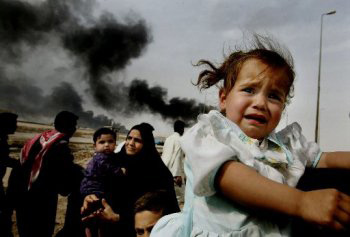 Conflict and political violence force millions of children and their families to flee their homes and as a result displaced families spend years in situations of uncertainty and insecurity. Girls face multiple gender discrimination from the earliest stages of their life and throughout childhood. 70 percent of school-age girls do not attend school. Ninety-four percent of births are not registered. Simon Jenkins fires a powerful salvo of scorn and spleen to mark the 10th anniversary of the imperial quagmire in Afghanistan. Among the glories and triumphs of this magnificent adventure, Jenkins notes the fact that international agencies are now calling for emergency aid to combat the imminent threat of mass starvation in the liberated land. This is what 10 years, thousands of deaths and trillions of dollars worth of "nation-building" have produced: a broken, brutalized, bankrupt society on the verge of murderous famine. Standing at #OccupyWallStreet this week, we got a chance to talk with occupiers, supporters, and tourists about the upcoming 10th anniversary of the U.S. bombing and occupation of Afghanistan, and plans to protest it next week, particularly starting Thursday, October 6 at Freedom Plaza in Washington, D.C. The great majority warmly embraced us, some literally, helping to write "Stop the War" in Arabic, Spanish, and French for our signs, or dropping donations in our bucket. People stared a long time at a photo of Afghan civilians wounded by a U.S. bomb, and asked, "Is that war still going on?" "Why hasn't it been stopped, because we're all against it?" "I think the people there must hate us." Read more of: Why is the U.S. war in Afghanistan such a central issue? U.S. Special Operations Forces have been increasingly aiming their night-time raids, which have been the primary cause of Afghan anger at the U.S. military presence, at civilian non- combatants in order to exploit their possible intelligence value, according to a new study published by the Open Society Foundation and The Liaison Office. The study provides new evidence of the degree to which the criteria used for targeting of individuals in night raids and for seizing them during raids have been loosened to include people who have not been identified as insurgents. I’d go for all of the above, and together, they are only one reason I’m calling you to protest on October 6, and in the days after, at the outrage of 10 years of aggressive war and occupation of Afghanistan by the United States. See World Can’t Wait protest plans and 10 Years and Counting. On Saturday August 6, 2011, a U.S. military Chinook transport helicopter was shot down in Afghanistan, killing 30 American soldiers, including 17 elite Navy SEALs, and eight Afghans. The mainstream news media was awash with somber reports about this being the "deadliest day" for U.S. forces in the ten years since the invasion and occupation of Afghanistan began. Notably, many news outlets such as ABC, NBC, CBS, and The Washington Post claimed the helicopter crash and its 30 American casualties marked the "deadliest day of the war", without adding the vital qualification, "for United States military personnel." Even the progressive website Truthout provided its daily email blast that day with the headline: "Deadliest Day in Decade-Long Afghanistan War: 31 Troops Killed in Shootdown." One year ago, WikiLeaks released the Afghanistan war logs. Around seventy-six thousand previously classified military reports were released in collaboration with the New York Times, The Guardian, and Der Spiegel. The contents of the documents revealed several dark realities of the war. And, the release drew condemnation from the Washington establishment that made certain the war logs had a minor impact. The significance of the documents, according to WikiLeaks editor-in-chief Julian Assange, was that they covered the war from 2004-2009 and provided details on incidents with Task Force 373, a US-assassination squad known as “the Squad Hunters.” The war logs showed this squad, comprised of Navy Seals and members of the Delta Force, kept a “kill-and-capture list” of targets believed to be drug barons, bomb makers or members of al Qaeda or the Taliban. The assassination squad would “seize” targets on the list for “internment” but in many cases the targets were simply killed. When I first saw the stories about the CIA’s super-cunning covert op – setting up a fake vaccination scheme to try to get DNA from Osama bin Laden's children in Abbottabad – I immediately thought: How many innocent people are going to die or suffer needlessly from this unconscionable tainting of medical programmes by Terror War subterfuge? How many people will now turn away from ostensibly genuine humanitarian efforts, wary of being used by foreign spies infiltrating their country? How many more genuine medical relief and health care workers will now be targeted as agents of militarist agendas in troubled lands already rightly suspicious of the murderous spy games being played in their midst? Now Médecins Sans Frontières has voiced the same concerns, in public blast on Thursday which called the CIA's toying with the lives and health of vulnerable children "grave manipulation of the medical act." NATO air strikes in the Khost Province district of Shamal this morning killed at least 14 civilians including eight children. It was the second strike in the province this week, with a Tuesday attack killing as many as 11 other civilians. NATO admitted to the first strike, but termed the slain “associated family members” of the Taliban they were trying to kill, and insisted some Taliban were killed. They have yet to comment on the new strike, though they did say they were investigating a third incident of civilian killings. I would like to see resolutions passed that say that we must end these wars because they are bankrupting us morally…that the cost of war is too high for our souls. The Afghanistan War. War itself is inherently immoral, but especially so when the fight is not between two state-sponsored militaries, but rather between a military superpower and a third-world country with 70% of its populace living in rural areas without electricity or running water and whose citizens do not even know why they are being attacked. It has been illegal from the outset in that it was waged against a sovereign country which was no threat to us, ignoring international law, and without adequate Congressional approval. And by the DoD’s own admission, it has not been effective. In fact, many experts believe that it has been counterproductive; that by killing thousands of people and destroying property and infrastructure we are creating enemies. We are propping up a government which is as corrupt as a crime syndicate, and labeling anyone who opposes us an “insurgent,” and therefore justifying their deaths.